So this is a post which I've had sat in my drafts for a while now and when I say a while, I mean around three months. I've just been a bit too nervous to write it! However, after revamping my blog and changing my topics around, bringing the personal parts into my blog is something which makes Kimberley Jessica that little bit special and I'm ready to share this post with you now! Around two-three years ago I was happy in my comfort zone. My little bubble which I didn't want to leave and was happy about not leaving and I was in this comfort zone for many years. A family friend used to say I was a hamster in a ball, and my bedroom would be my ball and he was completely right. Being in my bedroom was my hamster ball for many years and I would live in my bedroom and spend every moment of every day sat on my own doing something, god knows what I used to do! Suffering from depression isn't an easy situation and I've come to realise I suffer from anxiety too. I'd overthink a situation and think about all the worst outcomes of a situation and the situation wouldn't even be there yet. It's crazy how the mind works. Between 2010 and and 2014 was probably the hardest part of my life so far and that's when I was very deep into my comfort zone and I was happy to say "no" to every single opportunity that came my way. I didn't want to go out, I didn't want to see anyone, I didn't want to do anything I love and I pretty much spent my time in jogging bottoms and my comfort clothes because I was happy this way. During this stage I was also unable to speak to anyone face to face. I had absolutely no confidence in my self, and I had no confidence in speaking to anyone or walking up to someone and having a conversation, I just couldn't do it. My best friend had been my crush for all of these years, and the reason why it never happened was because if he ever came to see my brother, I couldn't speak to him. In my last year of school I wanted to make some changes and I wanted to build up my confidence which I lost from being bullied and my first step to overcoming this was to take part in NCS East. I loved this and although it was for a four week period, I only took part in the first week. Unfortunately I was with a large-ish group however there were only four girls including myself. During my first week, one of the girls stole everyone's money and the other two girls became quite bitchy. I can't forget I also missed my mum way too much as I had only been away from her once and that was back when I was in year 6, so I didn't carry on NCS but I was able to speak to completely strangers and a lot of them without wanting to curl up into a tiny ball and hide. Every part of me has always known that I need to escape my comfort zone, it was just finding the confidence to do so and meeting my boyfriend was the best thing to help me to do this. He loves me holistically and he loves all of the parts of me which I have always hated. After hiding away on my own in my comfort zone (my hamster ball) I never went anywhere so in the first two weeks of being in a relationship he took me out for dinner which I had never done before, we went ice skating, bowling, to the cinema and to various different places such as Cambridge and Lakeside. He took me to places where I had never been before and some how, he opened me up. The most amazing part of all of this, is how did he manage to bring me out of my comfort zone and help me to love myself and find the confidence which I lost many years ago? Although I still do not like calling up the takeaways to place an order or asking his Family for anything from shyness, after two years I could happily approach someone and say hello and I'd rather be outside doing something than sat inside my room day in, day out. Whereas many years ago, I didn't care about sitting indoors every single day, I kind of liked it. Happiness is not a destination. It is a state you seek, decide on, choose and work towards every single minute and moment. When you are 100% comfortable and happy with who you are, who you are designed to be and where you are meant to go, no one's opinions will matter because it's your happiness which over weighs it all. Last but not least, all of the magic happens outside of your comfort zone. Have you learnt anything about yourself recently? This post was so relatable I'm in a very similar situation now because of my anxiety. I struggle to meet new people and as I've always been shy I've struggled with things like that for a long time. It sounds like you have a lovely relationship with your boyfriend and how lovely that he's been able to help so much! Very inspiring post. I can definitely relate to how you used to feel a couple of years ago. I'm very much in my comfort zone right now, hopefully I'll be able to break out of it soon. Such a great read! Sometimes it takes another person to give you that boost and get you out there! I feel like I'm always in my comfort zone and need to be doing more myself. You are right- it is a journey! Thank you! Such an honest post! 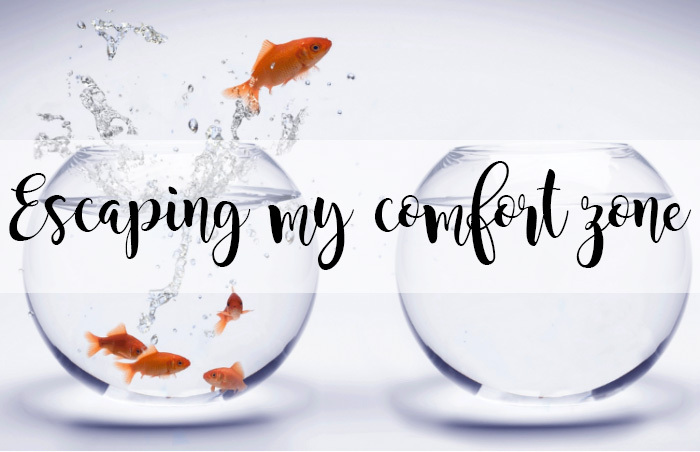 Getting out of your comfort zone is so hard especially when you a mental health issue! I'm slowly pushing myself more and more and living independently has helped that! What's In My University Bag? Work harder than everybody else, University Life.